How do you make the leading dish detergent even better? Design a line of innovative kitchen tools that are attractive, effective, and simple to use. Motiv helped Butler Home Products launch a full line of cleaning tools that stand up to the competition. When it comes to product design, the kitchen sink is a brutal environment. Consumers demand high performance but won’t compromise on simplicity and style. After conducting exhaustive category and user research, Motiv designed a line of cutting-edge cleaning tools to optimize the grease-cutting performance of Dawn Dishwashing Liquid. The collection includes unique, asymmetric ergonomic designs coupled with thoughtful innovations. For example, need a sponge with more bite? 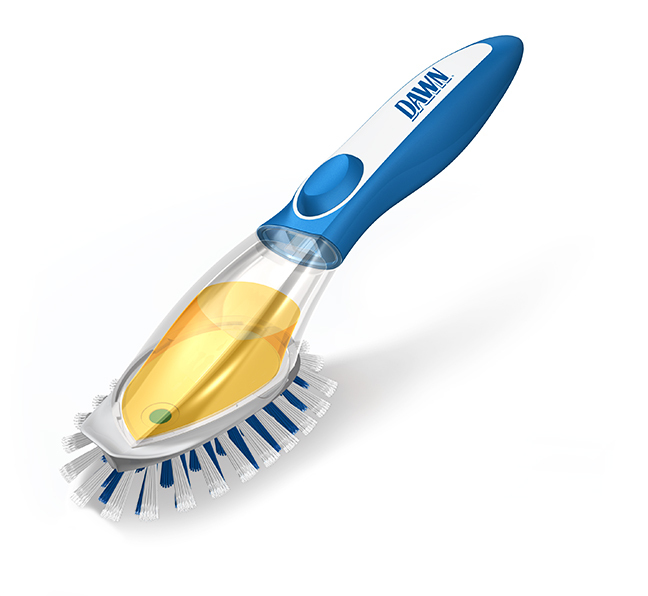 The Dawn Scrubber Sponge features a tapered shape to get into tight spots and a built-in scraper to cut through the crud. Motiv also designed packaging for the line to complement P&G’s exacting brand standards.